Hello i am a resto Shaman and i need help. I dont know what i am doing wrong but i dont get the max out of my healing. can someone explain what i am doing wrong. Maybe some good ideas for healing add ons. I went a bit through your logs and some stuff immediately stood out for me. 1. Your HST uptime is extremely low. It should be dropped on CD (every 30 sec. ), never only once a minute. 2. Your main CDs usage (HTT and Ascendance) are pretty low. You definitely could use them more, especially Ascendance. Saving big CDs for some accidental damage that most of times never happens doesn't help. If your HTT is assigned by RL - nothing to do here, but RLs normally don't assign Ascendance and you never used it more then once during a fight. 3. Your Elemental Blast usage is extremely low. This is not only Spirit buff but also a buff to your secondary stats that you are losing. On your Kormrok fight I even can't figure out what talent did you use: there is no EB casts, no Elemantal buff and no UF used. It is a big overall loss. I see that you run pretty low on mana, but still hardly cast EB. 3-8 times during a fight is nothing. I think that they are the initial problems that you should fix. I would highly recommend VuhDo as a healing addon. Here is its configuration from scratch. 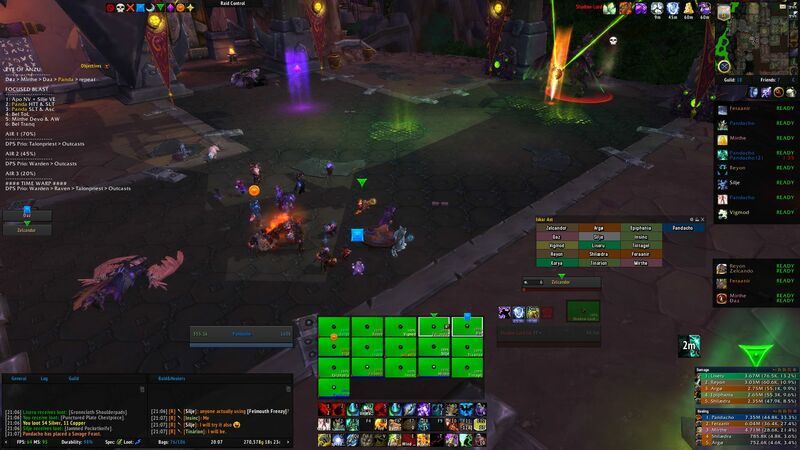 Here's its basic configuration guide, and here's the auras for resto shamans that you can use. yeah i just found out just before I came back to the forum. i appreciate the response.